Latest Update: 4/10/19 -- Flows on the Ark at Granite have jumped to about 750cfs. There is still a lot of snow in the high country making it harder to access some of the upper sections. Heading further south might make for a better experience. Nymphing with a yarn or small indicator is going to be your best bet at targeting these fish. Attractor patterns such as small stoneflies, eggs, and worms should get their attention. Your second and third fly is going to be your basic midge and baetis patterns sizes 18-22. If you are fishing streamers think about downsizing to something like a Crystal Bugger or a Lil Kim. The Arkansas River begins it's 1500 mile journey towards the Missisippi right here near the town of Leadville, CO. Ideal for a 3-5 wt rod, this portion of the Arkansas is largely a meadow stream and provides anglers the chance to target rainbow and brown trout in a high altitude, extremely scenic environment. Aside from fishing the Arkansas River, there are countless lakes and small streams that offer anglers a variety of places to spend a day. Turquoise lake, Hayden Meadows, Crystal Lakes, Busk Creek, Halfmoon Creek and the East Fork of the Arkansas are just a few of the many nearby waters this area has to offer. Many of these smaller creeks provide the oppurtunity at a "Grand Slam"-- a Rainbow, Brown, Brook and Cutthroat trout all out of the same river in the same day! Fall fishing can be Hit or Miss on the upper stretches of the Arkansas River. This stretch of river lays between the cities of Buena Vista and Leadville. Due to the elevation in this area and the freestone tendencies of the Arkansas River weather plays a huge factor when fishing this area this time of the year. This can be a great place to escape the crowds during the Fall if the weather persists. The Upper Ark has a great trout population, the majority being Brown Trout. In the very upper reaches near Hayden Meadows, an occasional Brookie can be found as well as other exotic trout species that wash down from Mount Massive Fishing Club. While very rare, Tiger and Cutthroat Trout have been caught here. There is also a healthy population of Rainbow Trout growing in numbers the closer you get to Buena Vista. As far as bugs go here it is all going to depend on the weather. On warmer days above 60 degrees, there is still the possibility for prolific midge, baetis and even caddis hatches. Terrestrials are also a major Fall food source on this stretch of water. On colder days Midges are going to be the predominant food source, with sporadic BWO hatches mixed in. Look for the fish to congregate to deeper holding water, plunge pools and riffle drop-offs. Fish will be holding here in numbers this time of the year because they will have less energy to expend chasing food in the cold water. I generally preach to cover water on the Ark during the Summer; in the Fall that isn’t the case. If you find fsh in one run, chances are it’s not the only one holding there so work the water thoroughly. 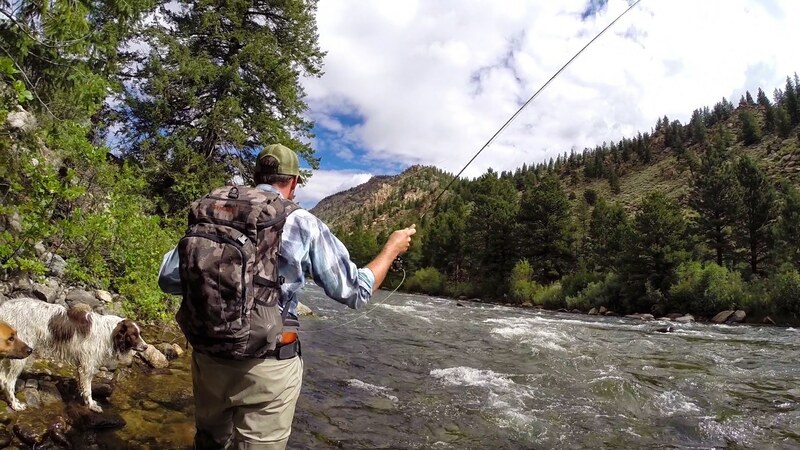 Lastly, Streamers on this stretch can be a very effective way to find fish. It almost contradicts everything I just wrote but, if you want to cover water Streamers will move a handful of fish looking to pack on protein before Winter sets in. Fly Recommendations- Chubby Chernobyls, Foam PMX, Stimulator, Graphic Caddis, Nitro Caddis, Buckskins, Barr’s BWO emerger, Juju Baetis, Radiation Baetis, Rainbow Warriors, Rojo Midges, Mercury Black Beauty, Brassie, Jujubees, Dorsey’s Top Secret Midge, rs2, Pheasant Tails, Biot Stonefly, Pat’s Rubber Legs, 20 incher stone, Dirty Hippie, Wooly Bugger, sparkle minnows, slump busters. River access for the upper portion of the Arkansas River is plentiful as well. Hwy 24 parallels much of the river and multiple parking areas, designated with a "P" sign, can be found along the roadside. Crystal Lake State Trust Lands, Reddy State Wildlife Area and the Hayden Ranch Recreation Area are all productive areas to check out when fishing this stretch of river.